After a quick series win on the road against our foes of New York, the Phillies tied for first place in the National League Wild Card race with the San Francisco Giants. The same Giants who, as fate would have it, are coming to town for a three game set after a offday Monday. San Francisco won the previous meeting in SF 2-1 back in late April. Charlie Manuel has said he’s not focused on the Wild Card race. And why he should he be? 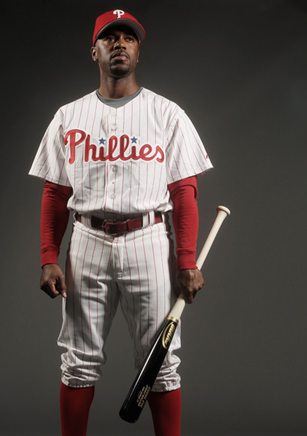 With Ryan Howard expected to return from the DL in the coming days and the activation of Chase Utley today – the Phillies now have their competition and the fate of the 2010 season right where they want them. After injuries to almost every major position player and then some, an unstable bullpen, a never-ending offensive slump -the Phillies stand on the doorstep of September with everything finally coming together for what seems like another incredible second half run. I typically give stats for my previews; break down the pitching matchups, how the batters fare against certain guys – and for this one, I can direct you to Phillies.com. (Realistically, I know you’re much more excited for the returns of Pat the Bat and Chase to care how they stack up against Oswalt or Zito respectively.) This series reminds me a lot of the one in mid September 2008 against Milwaukee. Behind the Brew Crew by four games for the Wild Card lead when they came to town for a four game set, we swept them and moved on from the Wild Card to take the NL East weeks later. I bring this series up because when it comes down to it, this team does what it needs to do fate presents such an opportunity. With the exception of Matt Cain v. Joe Blanton, I think the other matchups of Barry Zito v. Roy Oswalt and Jonathan Sanchez v. Cole Hamels do favor the Phillies. I don’t want to get ahead of myself and predict a sweep, but I think after this series the Phillies will be in the lead – but forget the wild card, send San Francisco packing with it. Let’s shoot to end the series atop the National League East and send one final message to Atlanta that the Phillies are coming. The Phillies will yet again look to break out of another slump after a disappointing series in Chicago 3-1. It will be the second four game series against St. Louis this season. In May, the Phillies won the series at Citizens Bank Park 3-1. Well, here we are on the morning of the second half of the 2010 season off the heels of the All Star Game in Anaheim with the National League’s first win since 1996 headed by Charlie Manuel; and halfway through a strange, unlucky, and sometimes baffling season of Phillies baseball. It seems like yesterday that many of us made the trek down to Washington for the debut of Roy Halladay back in April. On that day, in my first entry for this blog, I wrote about the kind of team the 2010 Phillies were. And how they showed us on Opening Day; the 11 run offensive outburst, stellar defense, and the first of many dazzling outings from our much coveted ace. No one could have foreseen the offensive slump that has seemed to have plagued us all season, the lack of run support for our starting rotation, or the endless and countless injuries. But then something funny happened. After a disappointing series with the first place Braves, and some misplaced blame on the fans by Shane Victorino; many of us wondered where this season was going, and I’m sure I’m not the only one who doubted if this was the same team of the last two seasons. It started with the improbable home run from Brian Schneider to open the series. The next night seemed like the Phillies were back in their slump; with no inspiration from the previous night. That is, until Greg Dobbs, Cody Ransom had their say; capped with the exclamation point by Ryan Howard. Then there was the almost perfecto, until a double by Chooch on his first game back from the disabled list, and a RBI single from Jimmy Rollins to provide the only run they would need. Capping off the four game sweep was a dazzling one run win spearheaded by Cole Hamels. By now, you already know that baseball isn’t for the faint of heart. The ups and downs aren’t for everyone; a true baseball fan knows to be in it for the long haul takes patience and thick skin. They also know how much sweeter th payoff of a 162 game season is to be the last one standing on a chilly night in October. And, we can still get there. The Phillies are a second half team in a division race that is anything but over. We’re still the team of the past two seasons, and perhaps this series is what it took to remind our 25 guys who they are; and reminded a passionate fan base that there is still reason to believe for that one night in October. So before you change the channel, or leave that game early – remember who this team is. Remember when you think things can’t get any worse, that we’re still the lucky ones – with players and a team and a chance to win that every baseball fan longs for. The ones who can pull off three improbable walks offs in three nights, the ones who see their ace pitch a perfect game, one of the few that despite the countless injuries and endless offensive slump still only find themselves a few games back – a team that may get down sometimes, and in our case really down, but are certainly never to be counted out. After a disappointing start to their American League East roadtrip, the Phillies will look to pull out of their slump in a 2009 World Series rematch against the New York Yankees. It was a road trip that featured the highest of highs and the lowest of lows. The Phillies are coming off a pathetic and disappointing road trip against their foes of the National League East, featuring two series sweeps at the hands of New York and Atlanta, a handful of shutouts,and the 20th perfect game in Major League history from Roy Halladay. The Phillies will be home for a seven game homestand against San Diego and Florida before Interleague play begins for the remainder of the month. Last year, the Phillies won the season series 4-2, with just one win at home and a sweep on the road.